Datolite,The ‘Stone of the ‘Conscious’, takes one on journey of discovery into the different areas of the mind, body and spirit, while encouraging one to be conscious to oneself, and to surrounding existence. 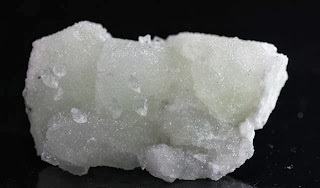 Datolite helps to break away false attitudes, it reveals the true self as well as true life. This is a stone that encourages one to be conscious of ones whole inner self. It helps alongside in the exploration, and improving of the mind, body and spirit. This in turn helps one to not only become more enlightened within, it also helps ones input and output to life become more positive and knowledgeable. A stone that steps with the wise visionary remarkably well, yet also helps in the teaching of the visionary student. Datolite stimulates the areas of the whole that are needed in such a delicate process, only allowing an output of this stimulation to match ones own vibrational state.